According to the 2012 State of Canada’s Birds Report, grassland bird populations on the Canadian prairies have declined by almost 40% on average since 1970. Significant declines are happening for a variety of reasons, including the extensive conversion of prairie grassland into cropland, high intensity farming practices, pollutants, linear (roads, power lines, pipelines) and oil development, the suppression of natural fire cycles and climate change. Many prairie bird species have recently disappeared from the northeastern periphery of their former ranges. 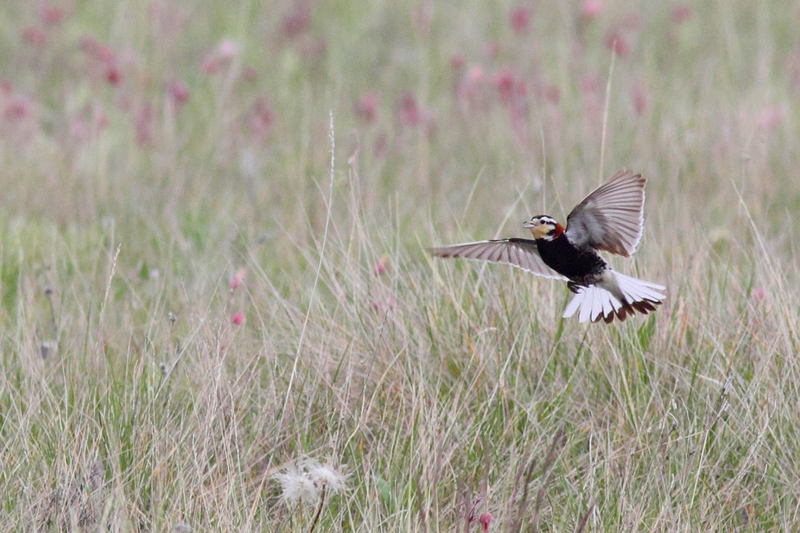 Remaining grassland birds are concentrated in well-managed pasturelands and small remnant patches of native prairie. Only the largest patches are able to support viable populations of area-sensitive species, such as Sprague’s Pipit, Baird’s Sparrow and Chestnut-collared Longspur. In order to protect these wonderful prairie birds from further range loss, the Manitoba Important Bird Areas (IBA) Program has launched the “Grassland Bird Conservation Initiative” in southwestern Manitoba. With funding from Environment Canada’s EcoAction Community Grant program, we aim to increase awareness of the plight of grassland birds and encourage landowner participation in the stewardship of essential prairie habitats. One of the last strongholds for threatened prairie bird populations within Manitoba is the Southwestern Mixed Grass Prairie IBA (see map of flip side). This IBA contains the towns of Melita, Lyleton and Pierson and includes three significant bird habitats known as the Poverty Plains, the Souris River Lowlands and the Lyleton-Pierson Prairies. This area is very rich in grassland and parkland birds. Several species are on the national endangered species list including the Burrowing Owl, which is in danger of being extirpated in Manitoba. More than two-thirds of Manitoba’s nesting populations of the Ferruginous Hawk and the threatened western subspecies of the Loggerhead Shrike have been recorded within the IBA boundaries. This area also supports most of Manitoba’s nesting population of the provincially endangered Baird’s Sparrow, globally vulnerable Sprague’s Pipit and globally near-threatened Chestnut-collared Longspur. In addition to the above species at risk, the bird specialties of this IBA that occur in good numbers include Sharp-tailed Grouse, Gray Partridge, Marbled Godwit, Upland Sandpiper, Says Phoebe, Grasshopper Sparrow and Lark Bunting. You can find out more about some of the rarer birds in this area by visiting the Manitoba Breeding Bird Atlas page for Species-At-Risk. Finally, we are pleased to provide a ‘Landowners Guide to Grassland Bird Conservation in Manitoba’. This document can be downloaded by clicking on the links below for a high or medium resolution document. If you would like a paper copy sent out to you, please contact Tim Poole, IBA Coordinator at iba@naturemanitoba.ca or call 204-943-9029.